A twenty-four line framed double column miniature of John the Evangelist on Patmos, receiving and writing down the visions of the Apocalypse, accompanied by his symbol the eagle; three of the four horsemen, the first holding a balance, the second a flaming cup, the third, only partially visible, with bow and arrow; the Woman in the Sun gives up her child to heaven; the war in heaven of the angels against the Dragon. In other Flemish breviaries and books of hours of the period John the Evangelist is represented in three ways. 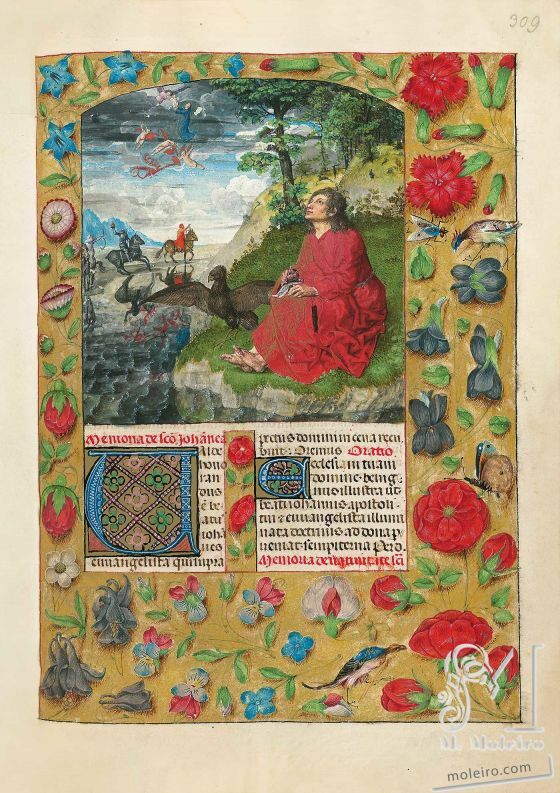 The first, as in the Isabella Breviary, shows him seated on the island of Patmos where he had his revelations, the Apocalypse, sometimes looking up at the visions, but sometimes just sitting and writing, accompanied by the eagle. The second shows him seated in a study writing his Gospel, and the third shows him standing or seated holding another of his emblems, the poisoned chalice, usually a chalice surmounted by a dragon-like creature to symbolise the poison. The eagle, which accompanies all these forms, is his symbol because that bird was supposed to fly the highest and closest to heaven like the words of John’s Gospel, and the poisoned chalice is another symbol because the Golden Legend recounts that he was challenged to drink from a poisoned cup to prove his faith, and that he survived the ordeal. In illuminated manuscripts the number of visions of the Apocalypse which are depicted are rarely so extensive as in the Isabella Breviary, but in Memling’s St John altarpiece of 1474-79 (Bruges, Sint-Janshospitaal, Memlingmuseum) many more are shown. The Carondelet Breviary and the Grimani Breviary are exceptional in showing the narrative scene of John drinking the poisoned chalice in front of the magician, Aristodemus, and other men. There is a full border of the first category with flowers, birds, a butterfly and an insect on a pale yellow-gold ground.